Hurricane Walaka, a powerful hurricane that hit Hawaii earlier this month, has wiped a Hawaiian island off of the map. 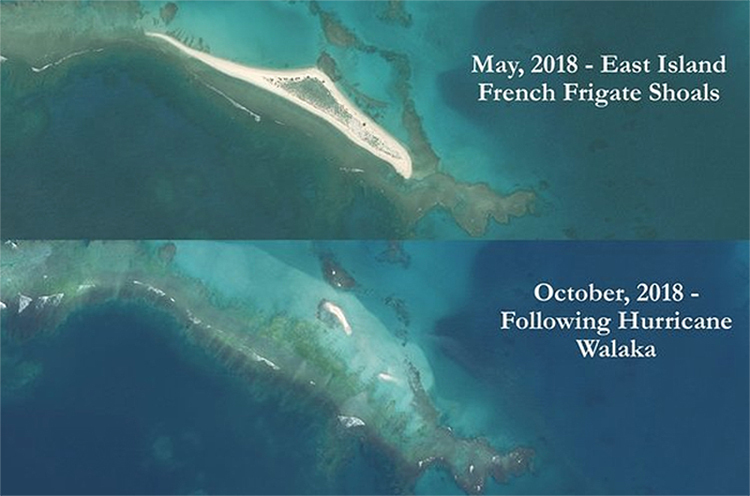 East Island, a remote, 11-acre area of gravel and sand that sat on top of a coral reef, has disappeared after coming into contact with the intense storm. According to The Guardian, scientists have confirmed that the island vanished after comparing satellite images of the French Frigate Shoals — a protected marine area in the northwestern Hawaiian Islands. Fletcher and his colleagues were researching East Island via drone devices and sand and coral samples. They were trying to determine the age of the island and determine its future, particularly in regard to climate change. Fletcher said that they wanted to monitor the island and are disappointed that it is gone; however, they have learned that the islands are more at risk than previously thought. East Island was only a half-mile long and 400 feet wide, but it was the second-largest island in the French Frigate Shoals. Even though it was small, the island was an important ecosystem for local wildlife. The critically endangered Hawaiian monk seal used East Island to raise their young. Threatened green sea turtles and albatrosses also depended on East Island for survival. In the right conditions, an atoll like French Frigate Shoals is always at risk when a hurricane hits. But climate change is warming the ocean and atmosphere, leading to more powerful and frequent storms. Fletcher said the loss is a huge blow, and the team did not expect the island to disappear that quickly. Randy Kosaki, a senior official for the Hawaii monument at NOAA, said that the “take-home message” is that climate change is real, and it is happening right now.